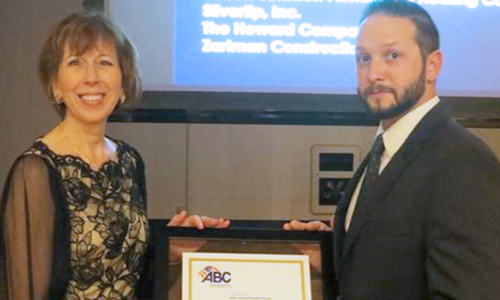 Congratulations to Tradesmen International’s State College, PA construction staffing office for being named a Gold Safety, Training and Evaluation (S.T.E.P.) award recipient on October 17th at ABC Central Pennsylvania Chapter’s Awards Banquet. The S.T.E.P. Awards is a premier event for all local ABC Chapters. They are presented annually to ABC member companies with exceptional safety records. Paul Forcellini, General Manager of Tradesmen’s State College Office, was on hand to accept this prestigious award. His office was evaluated on a number of statistical factors such as pre-planning for safety on job sites, incident rates, lost time and resources committed to safety. This recognition is a result of the daily efforts of all the Central PA employees who strive to provide a safe work environment for everyone. At Tradesmen, a safety award is the most important award that we can receive. Our employees are our most valuable resource – nothing is more important than ensuring that they go home safe every night! We have a top-to-bottom culture that empowers all employees to “speak up” if they are concerned about safety on the jobsite. We talk about this during our Safety Moments, at our Safety Cookouts and before our Toolbox Talks. Learn more about our Safety Program here.